Gandhinagar (Gujarati: ગાંધીનગર, Hindi: गाँधीनगर) - the capital of the state of Gujarat in western India. One of only three government planned cities in India, Gandhinagar sits on the banks of the Sabarmati River, serving as the administrative center of Gandhinagar District. The city is named for the father of the country, Mohandas K. Gandhi (also known as Mahatma Gandhi), who was born in Gujarat. Gandhinagar has the opportunity to incorporate twenty-first-century living style with the peaceful and spiritual teachings of Gandhi. Planned by Indian architects, the city was designed to create a pleasant living environment for its 200,000 inhabitants. Yet the challenge of living by Gandhi's spiritual teachings, the teaching of humble service and loving your enemy, faces many challenges. Sectarian hatred between Muslims and Hindus has on several occasions erupted into violence and death. Still, the hope is that Gandhi's legacy will prove stronger than religious bigotry. In 1960, the Indian state of Bombay was split into two states, Maharashtra and Gujarat. The city of Mumbai was given to Maharastra, leaving Gujarat without a capital city. At the time, Ahmedabad was selected to be the first capital of the newly created state. It was later proposed that a new capital city be constructed for the state along the lines of the other two planned cities of India, Chandigarh and Bhubaneshwar. The initial plans were to commission the renowned American architect Louis Kahn to build the city, so that it would rival Le Corbusier's work on Chandigarh in Punjab. However, these plans were eventually canceled, due to pressure to make the new city an Indian enterprise, consistent with the idea of the Indian independence movement which had brought the modern state into being. As of the 2011 India census, Gandhinagar had a total population of 208,299 Males constitute 53 percent of the population while females make up about 47 percent. Gandhinagar has an average literacy rate of 78 percent, which is much higher than the national average of 59.5 percent. Of that, male literacy is 82 percent, while female literacy is 73 percent. In Gandhinagar, 11 percent of the population is under 6 years of age. As a result of this change, the responsibility of creating the new city was given to Indian architects H. K. Mewada and Prakash M. Apte, both of whom had worked as apprentices during the construction of Chandigarh. The new city was constructed according to their plan and was named Gandhinagar after Mahatma Gandhi, who was a Gujarati himself. 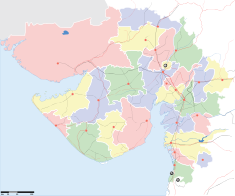 Upon completion of the new city, the administrative capital of Gujarat was shifted from Ahmedabad to Gandhinagar. Gandhinagar is spread along the banks of the Sabarmati River, with the main city designed on the west bank of the river on approximately 42.9 km² of land. Since it follows the river's path, the site is gently sloping, from north-east to south-west. Fine landscape lies along the west bank of the river, which gives the city a majestic appearance. 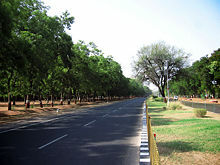 Gandhinagar is the only new capital of a state in India that was designed and planned by Indian town planners in service with the State Government. Since it is relatively new, it is also considered the "greenest" town in the world. Gandhinagar comprises thirty sectors, and it is a highly structured city with a well ordered street grid comprising blocks that are divided by two types of streets, similar to U.S. avenues and streets. Gandhinagar has "letter roads" (K, KH, G, GH, CH, CHH, and JA) and "number roads" (1, 2, 3, 4, 5, 6, and 7). The letter roads run parallel across the city perpendicular to the number roads, and both of the road types intersect each other to form a grid, with each block or square in the grid given a sector number. Each intersection is marked by signal names such as CH1, CH2, CH3 or JA1, JA2. This provides a high degree of organization and evenness to the various parts of the city. As a relatively newly constructed city, there are a variety of transportation methods available both to and from Gandhinagar. For air travel, the nearest airport is located in Ahmedabad, which is about 32 kms away. The city is serviced by rail by its own railway station, as well as the one in Ahmedabad. In addition, transport buses connect the city to various parts of Gujarat. Gandhinagar is located at 23.22° N 72.68° E. It has an average elevation of 81 metres (265 feet), and it sits on the banks of the Sabarmati River, located in north-central Gujarat. The city spans an area of 205 km² (79.15 square miles). There are three main seasons in the city: summer, monsoon, and winter. Aside from the monsoon season, the climate is fairly dry, to the extent that the Sabarmati River often dries up, leaving the city with low water levels. The weather is hot through the months between March and June, when the maximum temperature stays in the range of 36 °C (97 °F) and 42 °C (108 °F), and the minimum in the range of 19 °C (66 °F) and 27 °C (81 °F). From November to February, the average maximum temperature is around 29 °C (85 °F), the average minimum is 14 °C (57 °F), and the climate is extremely dry. The southwest monsoon brings a humid climate from mid-June to mid-September. The schools in Gandhinagar are affiliated with the Gujarat Secondary and Higher Secondary Education Board. Under the 10+2+3 plan, students complete ten years of schooling, and then enroll for two years in Junior College, where they choose from one of three academic tracks: arts, commerce or science. This is followed by either a general degree course in a chosen field of study, or a professional degree course, such as law, engineering, or medicine. The well known schools are Serva Vidhyalaya Kelavni Mandal Seth C. M. High school, St. Xaviers, Mt. Carmel, Gurukul, Swaminarayan School, and Chaitanya School. A large number of educational institutes are set up in Gandhinagar. This is due to a combination of two factors: the scarcity of land to expand campuses in Ahmedabad, and the policy of the Gujarat government to establish a strong knowledge corridor in Gandhinagar. The Institute of Petroleum Management (GSPC), the National Institute of Fashion Technology, and the National Institute of Design were all given land by the state government to set up bigger campuses in Gandhinagar. The National Institute of Co-operative Management was set up in the city in 1999, to offer MBA and MCA degrees affiliated with Gujarat University. The Dhirubhai Ambani Institute of Information and Communication Technology was set up in the city in 2001 by Reliance Industries, India's largest private sector company. In 2003, an Engineering Institute was established, and in 2005 the Gujarat National Law University was established in the city along the lines of the prestigious National Law School of India University, located in Bangalore. Gandhinagar is also home to a variety of different academic science institutions. The Institute for Plasma Research is the foremost scientific research organization in Gandhinagar. The institute shifted to its present day campus in Gandhinagar in 1998 and is a leading plasma physics research center in India. Another research institute was inaugurated by President APJ Abdul Kalam, called the Indian Institute for Advanced Research. This institution is concerned with biotechnology based advanced research, and some of its key areas of research include: human health and disease, plant science, biomolecular medicine, industrial biotechnology, bioinformatics, and structural biology. The other prominent scientific organization in the city is the Nisarg Community Science Center, which works to increase public awareness on science, technology, and environmental issues. 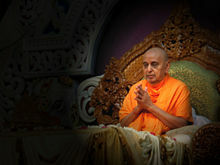 Akshardham, the famous temple of the "Swaminarayan Sect," which is believed to be the richest sect in the world, is one of the most famous sites in Gandhinagar. The unique cultural complex was built in memory of Lord Swaminrayan, and is surrounded by lush green gardens and beautiful water fountains. In addition, over 6,000 tons of pink sandstone went into the production of the temple, providing it with a vibrant appearance that attracts tourists and pilgrims even from the farthest distances away. Gandhinagar has recently been the victim of a terrible trend of communal violence that has plagued Gujarat in the last few years. 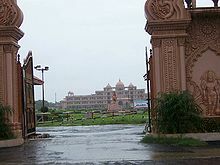 On September 26, 2002, two gunmen entered the Hindu Akshardham temple in Gandhinagar and began firing indiscriminately at worshipers. After a 13-hour siege, National Security Guard commandos were able to take out the gunman, but by that time nearly 100 Hindu devotees were left wounded and 30 were killed, including eleven women and children. Letters found in the pockets of the attackers later revealed that they belonged to the Tehrik-e-Kasas ("Movement for Revenge"), which is a movement that has made it its goal to avenge the deaths of Muslims that were killed in communal riots a few years earlier in Gujarat. ↑ Census of India 2011, Cities having population 1 lakh and above, Census 2011 Retrieved April 25, 2012. ↑ Falling Rain Genomics, Inc - Gandhinagar, Falling Rain Genomics, Inc., 2004. Retrieved December 31, 2007. ↑ Gandhinagar Weather - Records and Averages. Yahoo! Inc.. Retrieved December 31, 2007. ↑ "Govt puts knowledge corridor on fast track", Indian Express. Retrieved December 31, 2007. ↑ Akshardham terrorists were LeT members: ATS chief, rediff.com India Limited, 2003. Retrieved December 31, 2007. Apte, Prakash M. The building of Gandhinagar:New Capital of Gujarat. Kolkata: Power publishers, 2012. This page was last modified on 19 May 2017, at 16:29.